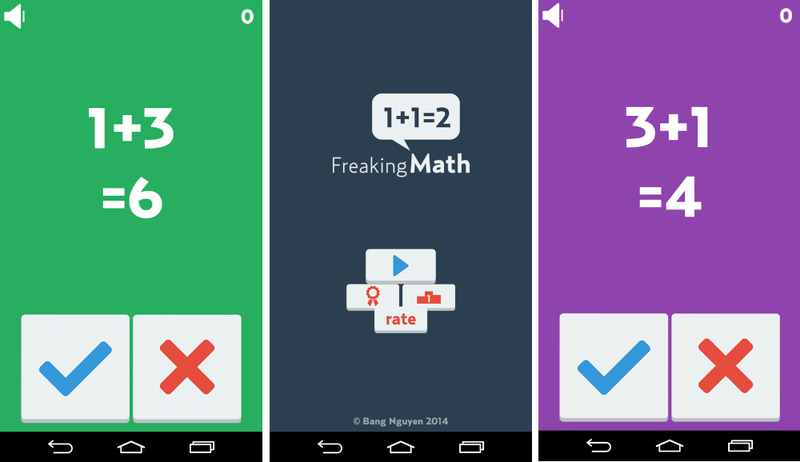 Thanks to our friends over at Phandroid, I found a new game to share called Freaking Math. At first, I wouldn’t dare download a game that has anything to do with math, as it was one of my more difficult subjects during school. I was more of a P.E. and Arts & Crafts kind of kid. Anyway, after downloading the game, I found that the math is very easy (2+2 = 4 and 3+1 = 4) type of stuff, but the real trick is making your brain work quickly enough to solve the problem and then beat the timer. You only have a couple of moments to recognize the correct answer, then hit the appropriate button, correct or false. If you run out of time, you lose. If you get it right, it keeps going until you lose. The reason why this game becomes so aggravating is that the timer seems to get shorter and shorter as you go through problems. As soon as your brain even recognizes the problem in front of it, the time is up. My top score is 6 as of right now, so beat that. The game is completely free to download and play. Have at it.